Photo of Kaveh Akbar (right) by Hieu Minh Nguyen. In A Portrait of the Artist as a Young Man James Joyce writes, “When the soul of a man is born in this country there are nets flung at it to hold it back from flight. You talk to me of nationality, language, religion. 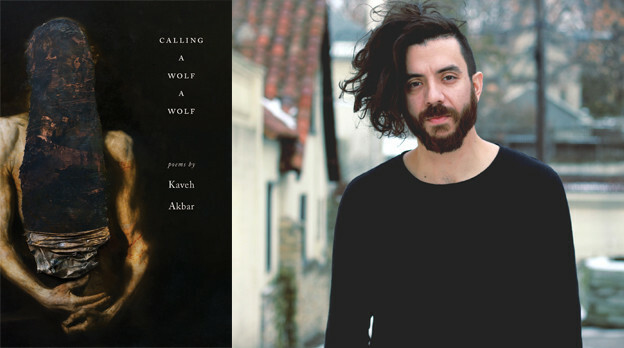 I shall try to fly by those nets.” Kaveh Akbar’s Calling a Wolf a Wolf offers various artist portraits of its own, exploring this ground with candor and lyricism, traversing time, culture, and language to create a poetic topography that is both familiar and unexpected. This long-awaited debut collection by Akbar fulfills the promise of his earlier chapbook Portrait of the Alcoholic, from which several of these poems were culled, and seeds the ground for poems and collections to come, with portraits that are ever-shifting, yet always compelling. “SOOT” acts as a prologue, a subtle pencil drawing of the collection’s recurring themes: self-destruction, revelation, and renewal. of pomegranates and garden tools. I knew the way — through the soot, into the leaves. In this poem and the ones to follow, Akbar’s speaker acknowledges accountability as one who has harmed self and others; and graphically describes the intent — “pulling out the claws” — to end such behavior. But the poem also signals the enormous vulnerability of this action: an animal declawed is at the mercy of the world. The imagery of pomegranates resonates on a cultural level — their ruby seedlings play a notable role in a variety of Persian holidays and foods — and also harkens back to the myth of Persephone, marking a life that embraces both darkness and light. Calling a Wolf a Wolf is divided into three sections — “Terminal,” “Hunger,” and “Irons” — with a denary of poems whose titles begin with the phrase “Portrait of the Alcoholic” dispersed throughout. There’s a suggestion of a reversal of Dante’s Inferno whereby Akbar starts with the dismantling of the self, through a rebirth of mortal desires and delights and, ultimately, a nascent grace. Yet ruminations on the experience of and emergence from addiction are only one layer of these poems. The book strips the self of its protective covering and in so doing gets to the core of what it is to love, grieve, embrace joy, inflict pain, and seek redemption. As a native speaker of Persian, I found this poem particularly meaningful, as I use these same phrases almost daily, and toggle repeatedly between languages in conversation, especially with my parents. How Akbar structures the switch between Persian and English is most intriguing: the parent speaks the language that’s alien to her, and the speaker responds back in the only Persian he has left. Both do their best to communicate over a chasm that’s less linguistic than emotional and employ historically connecting rituals that now separate them further. I still find that there are many words and emotions that aren’t easily translatable from Persian to English and vice versa. I’ve been told that depending upon which language I am speaking, how I vocalize, even my mannerisms, shift. Bicultural people have the benefit of more flexible citizenship but are also more easily subject to rootlessness. There are times when I feel that, despite the number of languages I speak, I’m still unable to express myself exactly as I want to, as I need to, and Akbar’s poems are particularly adept at describing these nuances. Akbar uses language as both entreaty and absolution. What connects us to ourselves, to each other, to the universe, how delicate is that clasp, how long is the fall, and how do we gain the absolution within the grasp of these portraits? 1. James Joyce, A Portrait of the Artist as a Young Man (New York: Penguin Books, 1999), 174. 2. Kaveh Akbar, Calling a Wolf a Wolf (Farmington, ME: Alice James Books, 2017), 1. Quasi-nonintentional poetry and these dark times?